Approximate Time of Death was my very first published story and was included in the Decalog series of short story collections, published by Virgin Books and edited by Andy Lane and Justin Richards. 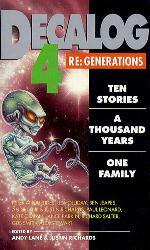 Decalog 4 was the first of the series not to carry the Doctor Who logo, since Virgin had just lost their licence to print Who fiction. Check back here later for the story of how I earned my first paying gig.